A tofu firm in texture with a meaty texture, Organic Tau kwa holds up well in deep fried and stir fried dishesor for barbeques. Unicurd™ Tau kwa comes in 2 piece pack and 4 piece pack. 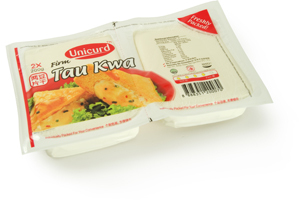 The 2 piece pack allows one to cut and store the unused tau kwa through a "easy seal" technology into individual pack. Please see pack for detailed instructions. Unicurd™ Springy Silken Tofu also has a high amount of Isoflavones which allows one to prevent heart disease.FDA states that consumption of 25 grams of soy protein a day, as part of a diet low in saturated fat and cholesterol, may reduce the risk of heart disease. A serving of Unicurd™ Springy Silken Tofu supplies 5.3 grams of soy protein. Daily Requirements: 2 packs of Unicurd™ Springy Silken Tofu a day is all you need to meet your daily requirement. With no preservatives and no cholesterol, it is a healthier choice for you.